I am Robin-Vivienne Van Breda, a 24-year old, black woman who was born in Observatory, Cape Town and bred in Mitchell’s Plain, Cape Town. I am a bold, liberating being who has transcended through society’s programming/dictation of my being to alignment with God’s intention for my being and existence. Society programmed me into believing that (school) Top Academic achievers are to be Accountants, Lawyers, Engineers and Doctors – with immense disregard for why they were birthed/their life purpose. I had to do three years of Bcom Accounting at the University of Cape Town (amongst other things) in order to align with my life purpose. My soul was in strife to the point of being admitted to a psych ward and consequently being academically excluded. I chose not to appeal my exclusion as I was guided by our Higher Power to choose to take time off in order to transcend through suicidal desires and figuring out of my life purpose. Consequently, I realised my assigned life task is to be an artist through dancing, rapping, writing songs, producing music (ever since knowing these 3 related to Sound, I acquired a Young Guru scholarship to study Sound Production at The SAE Institute – which I am currently doing) photography, videography, creating shoot concepts, writing poetry, written work, books, being a Mental Health speaker, establishing a global mental health foundation, teaching in schools and activism in various forms. I am an extension of God in the human body of Robin-Vivienne Van Breda who has chosen to ascend this earthly realm and execute an assigned task(s). Why am I creating a ClicknDonate page? To execute a part of my assigned task which is to self-publish the book I wrote in 2018. The name of this book is ‘bellator luminis’. Writing is an emotional, psychological and liberating outlet for me as I achieve a lot of transcendence in my emotional, psychological and mental strife, through writing. Consequently, you are to understand that in the year 2018 I got extremely sick and lost my ability to walk (and) then walk without limping for 11 months. I had to do hydrotherapy (amongst other treatments) to retrain my body to walk again. I detached from my emotions so much that they started to process themselves in my body so my health would fluctuate based on my subconscious beliefs, emotional status, thoughts, words, actions thus if they were negative my health would fluctuate accordingly. 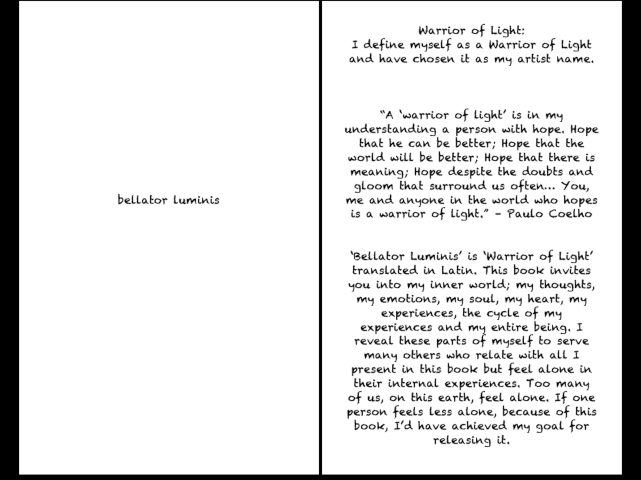 As a result, I wrote ‘bellator luminis’ throughout the year 2018 (completed 23 January 2019) of my inner world; my thoughts, my emotions, my soul, my heart, my experiences, the cycle of my experiences and my entire being and all the gifts that brought me to this point of healing – which result is that I can walk now. Why I write and choose to publish what I write? To offer Love, comfort, endless Light, empowerment, strength and companionship to each person this book lands in the hands of. To invite people into my inner world; my thoughts, my emotions, my soul, my heart, my experiences, the cycle of my experiences and my entire being. I reveal these parts of myself to serve many others who relate with all I present in my writing but feel alone in their internal experiences. Too many of us, on this earth, feel alone. If one person feels less alone, because of ‘bellator luminis’, I’d have achieved my goal for releasing it. So I share my pain with others so they never need to feel broken because of any pain they feel as they ascend this earthly realm. (Please see attachments uploaded to/with this page; they include snippets from ‘bellator luminis’, the meaning of the book title and further intentions. Please understand the incorrect use of grammar in the pieces shared were intentional. Please note that R15000 is the cheapest quote I found given the entire vision of the book (i.e. design, layout etc). Please feel free to donate any amount you can and want, many R5s can really make a difference, thus I am grateful for any amount given. All donations are blessings. I speak faith over this whole page as I release it into your hands and await immense support.